St. Paraskevi was not an ordinary woman. She was a spiritual meteor, a bedrock of virtue, unshakable amid the ocean of the corrupt community. She implemented that which Christ said, that: “He who hears my words and keeps them resembles a house built upon the rock, and though the rains came and the winds and the rivers fell upon it, the house was not shaken.” (Matthew 7:24-25) And St. Paraskevi was a bedrock of virtue. Foamy waves fell upon her, the greatest waves of life. First, the wave of corruption fell upon her. She was not born in a small village. She was born in the most corrupted city, which in the Holy Scriptures is called the Babylon of the world due to its corruption (Revelation 17:5). She was born in Rome, in a suburb of Rome. But however, she remained uplifted. She was a lily among the dung of her community. Let us all hearken to this, for when we see some woman being led astray, we say: “The community is responsible.” Yes, the community is responsible, I don't deny this. But she herself is also responsible. Give me a woman who loves Christ like St. Paraskevi, and throw her into the most corrupted community, and no wave and no devil could shake her. As soon as one wave left, a stronger wave fell upon her: the wave of orphanhood. This wave is terrible. St. Paraskevi was orphaned of her father and her mother. Because of this she is a protector of orphans. She was orphaned at that age when children could become prey to unscrupulous traffickers who try to exploit them. But she stood tall even while an orphan. She had within her a great fervor for holiness, the life of virginity and grandeur. Woe to the woman who does not have these great desires. No matter how high she climbs, no matter how many qualifications she has, she is deplorable. It is better to be an unlettered villager, which is like a lily, like the flowers that grow in the crags of the rocks of our homeland. Therefore, the waves of corruption and orphanhood fell upon her, but she remained untouched. Because of this I call her a rock. Furthermore, another rock fell upon her, that of money, of wealth. After the death of her pious parents, she remained the sole inheritor of their vast property, which they left to her. Every other girl would think differently. One might buy silken clothes, one might go to dances and gatherings, one might run right and left, would go on trips, would experience the spirit of the sinful life. St. Paraskevi however did the opposite. Money is a great temptation. It is better to be a blessed poor person. Thrice-blessed are little huts, more than great homes. Because in huts dwell diamonds, while in the palaces and the large homes dwell many times prideful souls, who do not love Christ. Money fell into the hands of St. Paraskevi. But she did what St. Anthony did, who had also inherited vast property. He went into church one day. His ear hearkened to the Priest who was reading the Gospel: “Sell your goods and give them to the poor.” (Matthew 19:21) Sell everything and give them to the poor. Anthony heard this. And he did not say that Christ was saying this to others. He distributed his property to the poor. As he hearkened to the words of Christ, so did St. Paraskevi. She kept only a small amount, and with this she founded a small sisterhood of orphan women virgins, who were dedicated to preaching, to enlightenment and to philanthropy. And her martyrdom began. They threw her in a dungeon in the prison. They whipped her with bullwhips. They threw her to the wild beasts. They threw her into a cauldron with burning tar and oil. She endured many forms of martyrdom, but all of these she conquered through the power of Christ. At the end, her hour came. They took her to a temple of the idols with statues of the false gods. She knelt, closed her eyes and made a mystical prayer to God. Immediately, there was an earthquake. The statues fell to the earth and became dust. They couldn't stand it anymore. Thousands of barbarous hands of the idolaters seized her, took her outside and to the place of execution. Her face was shining like the sun. She knelt, prayed and thanked God. Finally, she was beheaded by a Roman soldier. And while her precious head fell down, and her blood watered the earth, her soul, white as a dove, flew to the heavens. We live in a time of Babylon, a time of the Apocalypse, when the devil is roaring. He tries to strike the whole world. But most of all, he rabidly fights to strike and to soil girls and women. He wants not a single girl to remain unsoiled. He fights we terrible magazines and newspapers. He soiled our girls with terrible brochures, with movies, with TV shows, which are schools of crime and dishonor. He soils them with mixed baths, with terrible photographs, with corrupting dances, with parties. The day will come when you will not find a pure girl. What will we do? To arms, my brethren, to arms! Not to physical weapons, but to spiritual ones. Fathers, mothers, look towards the honor of your girls. I'm finished, but rather, I'm not yet finished, because I want to be paid. What payment? Money? I am a monk and I leave that to you. I will not finish my homily unless my soul is satisfied. Do you want your homes to be blessed and your girls to be secure? 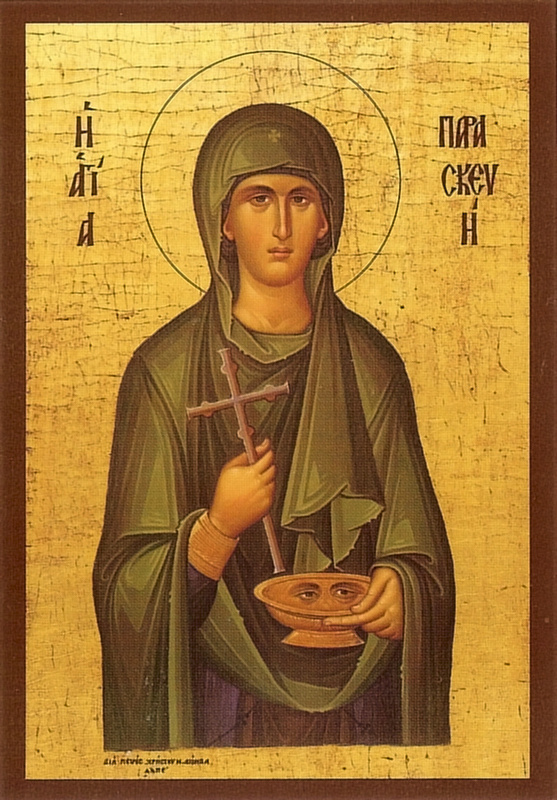 Today, the feast of St. Paraskevi, I entreat you all to do three things. First, go straightaway to your home, and look everywhere to find terrible articles and pictures, and gather them to light them with a holy fire to burn them all. 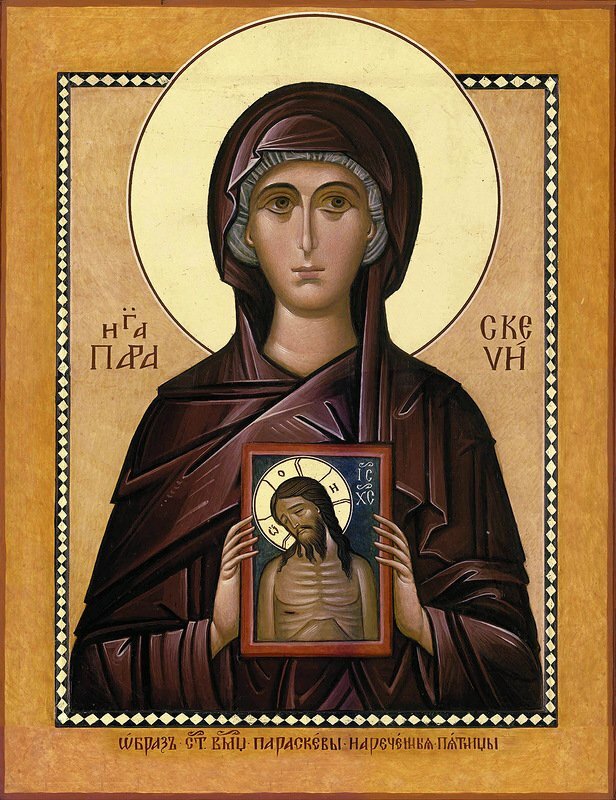 Second, I recommend to all of you to go buy the life of St. Paraskevi and an icon of hers to hang in your home, and speak to your children: “My daughter, my child, become like St. Paraskevi.” And the third thing? Having done the first two, light a candle for the wayward women, those who live in filth and dishonor, and say to St. Paraskevi: “St. Paraskevi, you who are a lily of heaven, help these women of Greece, the women of the whole world to return near the Panagia, near to God, near to Greece, so that we might all have the protection of the Holy Trinity”, Whose blessings I pray might be with you all. Amen. 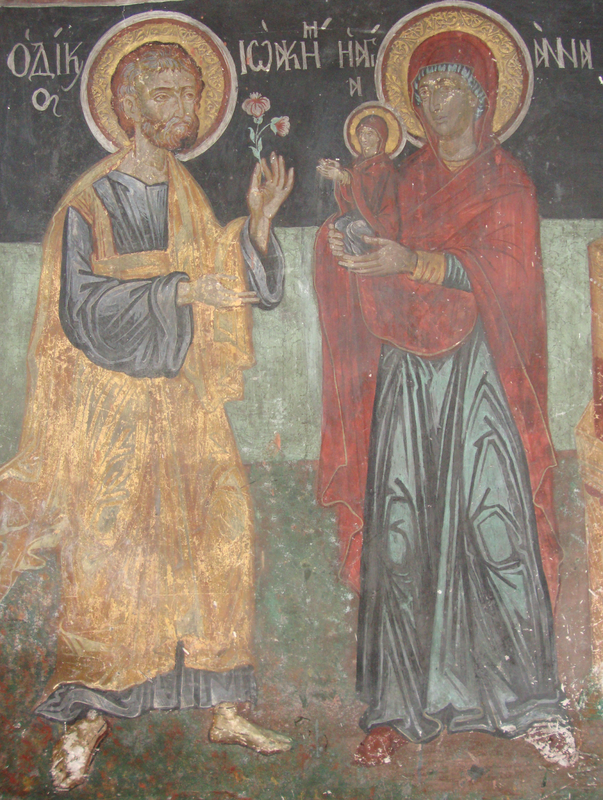 "As we observe this memorial of Christ's ancestors…"
As we observe this memorial of Christ's ancestors, * of Joachim and Anna * who were saintly and blameless, * we glorify our tenderly merciful Lord and Redeemer unceasingly; * for He has herefrom translated them unto life * indestructible and aging not. 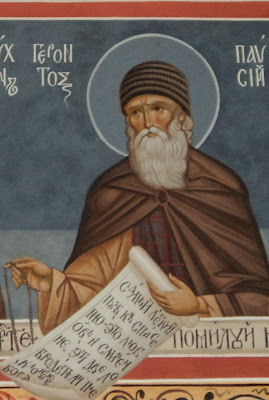 Note: The following is my amateur translation of the third canon (in the third tone) in a series of eight canons in the eight tones written by St. Joseph the hymnographer to honor the great martyr and healer of Christ, St. Panteleimon. 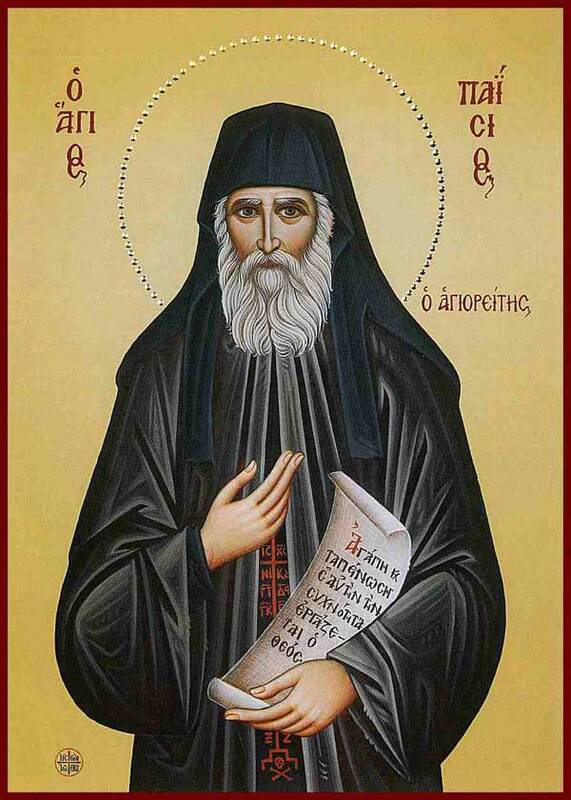 These are very beautiful and compunctionate hymns, and rightly praise such a great wonderworker of Orthodoxy. For the full texts of the canons in Greek, see here. If I am not mistaken, these are used around the feast of the Saint (i.e. either in the days leading up to or following his feast) in his Monastery on Mount Athos to more fully celebrate this great feast, the feast of the Russian Monastery of the Holy Mountain. May St. Panteleimon intercede for us all, and grant us healing of the passions of our souls and bodies! Amen! Truly, you have been shown to be a Martyr of the Savior, O glorious Panteleimon, as all of the faithful piously know you to be, and to your fervent protection we hasten and cry out: deliver us from every evil, through your intercessions. You deposed the lawless King, and found the Kingdom not of this world, and on behalf of Christ you suffered pains, O unconquerable Martyr. Ever entreat Him, that every pain might be driven out of our hearts, O glorious one. With rejoicing, you set off for tortures, O glorious Panteleimon, and you destroyed all the soul-corrupting power of the enemy. Deliver us from this danger, and strengthen us all through your intercessions, O blessed of God. Daniel beheld you once as a mountain, O Lady who gave birth to God, from which a stone was cut, which truly was made to shatter all the idols of delusion, while refashioning us. Through calling upon God, you raised the dead man, O wise one, and rejoicing, you offered to Christ your unwavering mind, O Martyr worthy of praise. Deliver us from the stupor of sins and afflictions and dangers, O Martyr of Christ, we who are ever enriched by you, our unshakable intercessor. You have blunted the evil arrows of the tempter, O Martyr, through your holy pains. Deliver us from him, we who call upon you with faith. 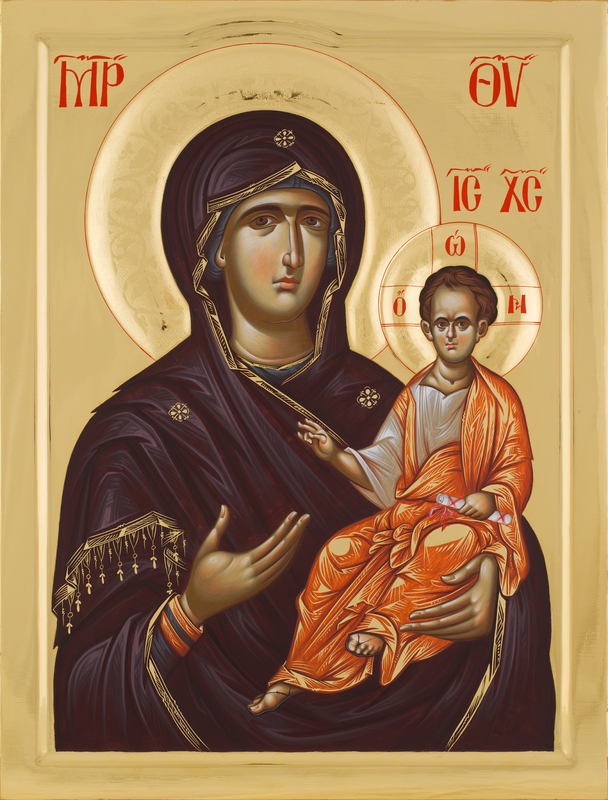 The Almighty Lord desired to dwell within your womb, O Theotokos, and gave himself to be born, for our divine rebirth. Heal, O Christ, our souls and bodies, through the prayers of Panteleimon, your beloved healer, O Word, and grant us Your good things, O only greatly-merciful One. 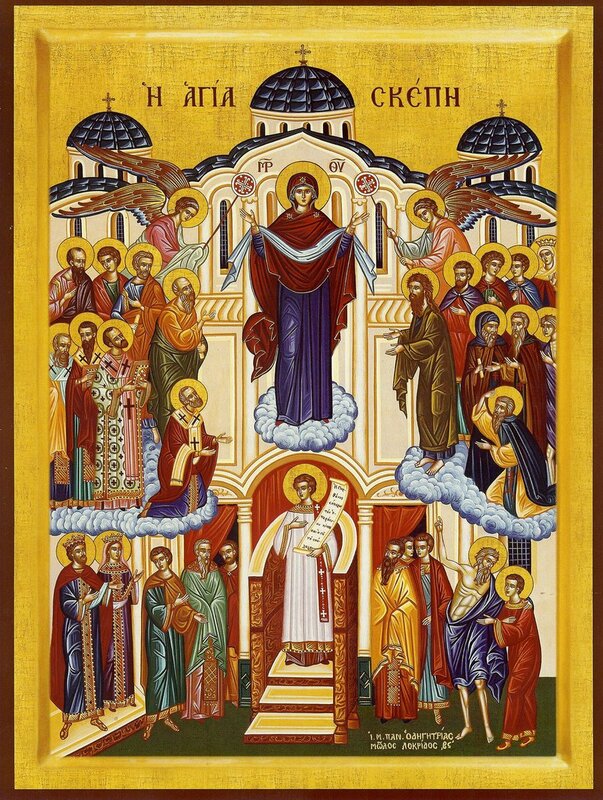 You have been shown to the world to be the boast of champions, for you rejoiced in the wounding of your members, O Panteleimon, empowered by the grace of the Bestower-of-Crowns, therefore we praise you. Deliver us from worldly scandals through your intercessions, entreating for the forgiveness of all kinds of sins, O all blessed one, and the correction of life, for we have been enriched by you, our great protector. You alone among women remained incorrupt after childbirth, you alone nursed the Nourisher of all with milk, O Virgin-Mother, therefore we glorify you, and out of necessity bless you with faith. You were reborn as a sanctified Temple of the All-Holy Spirit, and cast down the temples of the idols to the ground, O all-blessed Panteleimon, therefore, we hymn your intercessions with fervor in your divine temple, and we are saved. 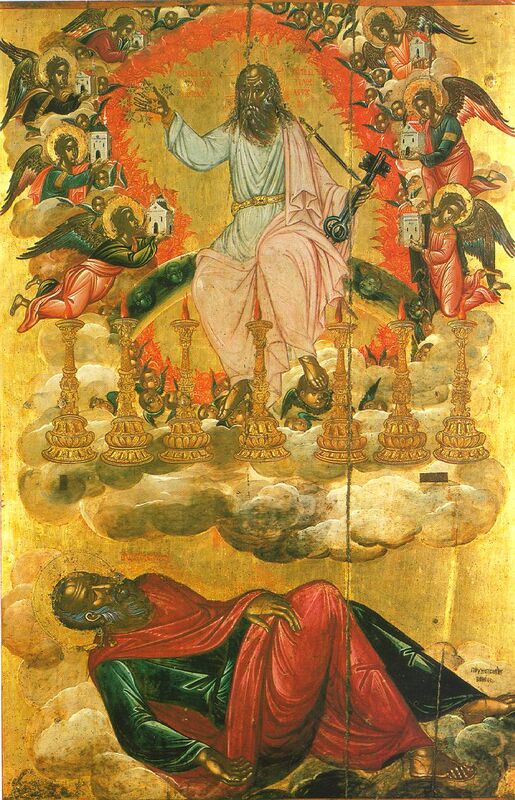 Having been pierced in the flesh and lit aflame by torches, O blessed one, you received refreshment from Christ the Lord Who appeared to you, O Panteleimon, and He extinguished the flame of fire, while lighting the eros of your heart. Those who were darkened by delusion, beholding your wondrous deeds, O Martyr, were led towards the light of godly knowledge, therefore, shine upon me, who am darkened by sins, and through your prayers, lead me towards the paths of repentance. You were shown to be an all-radiant palace of the King, O All-Spotless One, and a fiery throne on which He sat, while lifting up mortals from their ancient prostration, who out of contrition glorify you. Your blood ran upon the earth, therefore drying up the rivers of impiety, and watering the hearts of the faithful, O all-famed one, who honor your sacred gifts. You stopped the mouths of beasts by calling upon Christ, O all-honored one, escaped being food for the lions. Deliver me from this evil, through your prayers, O holy one. The evildoers bound you to a wheel, while your intellect was bound to Christ, and thus you were unshakable, O ever-memorable one, equal-in-honor to the Angels. We honor you with hymns in a godly manner, we who are saved through you, and we pray to you, O Lady Theotokos, to intercede on behalf of all, that we might find your consolation. Your nous was mystically radiant and aflame, O ever-memorable Champion, as you hastened to dark tortures, chanting: blessed are You, O God. O Champion, you rejoiced enduring being boiled, receiving therefore divine refreshment. But entreat that we might be delivered from eternal fire through your prayers. Chanting unto Holy God, you completed the contest. But we entreat you, O holy one, that we who have gathered unto the glory of God and to honor you, might be delivered from every danger. As one wider than the heavens, you have birth to God, Who is uncontainable by everything. Entreat Him, that we be delivered from every sadness, O Birth-giver of God. 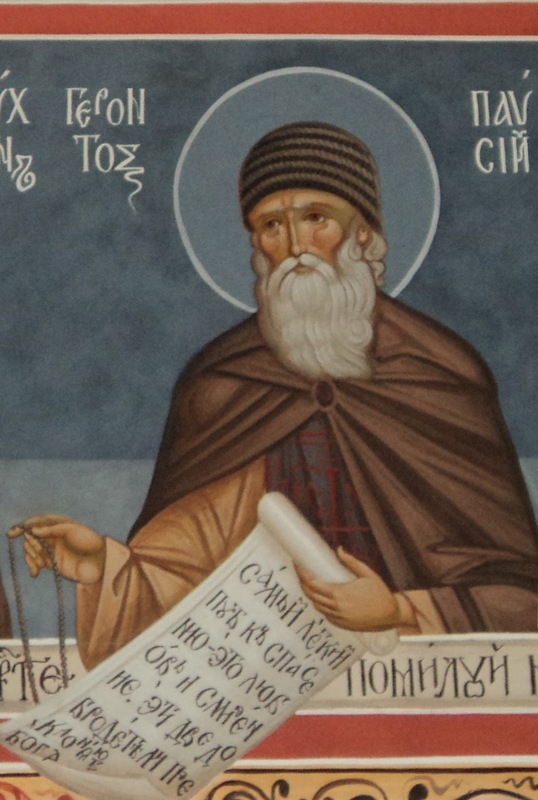 You were thrown into prison, while you rejoiced in the spirit, O Martyr, and you kept the commandments of Christ, while unbinding through your shackles, the evil of the enemy, crying out: Bless the Lord, all you His works. Having been set aflame by the fire of divine love, you were not afraid of the fire that ever burns, O wise one, but you ceaselessly cried out to Christ in joy: Blessed are You, O God of our Fathers. O Martyr who once enlightened the eyes of the blind man, open the eyes of my heart, through your prayers, O Panteleimon, that I might see the divine light and live. The Lord took on flesh from your, O All-Spotless One, and appeared to men upon the earth, delivering from ignorance and shining upon all with the light of knowledge. 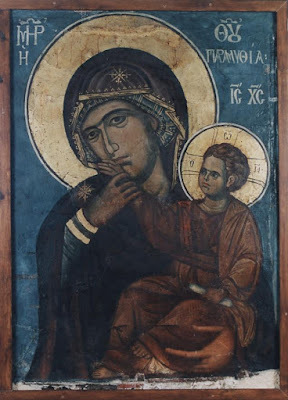 Entreat Him, O Virgin, for those who now bless you. You finished the contest in holiness, having moved the people who beheld your wonders, O every-memorable one, and you took refuge in God, and received the crowns of the Martyrs in the Spirit. 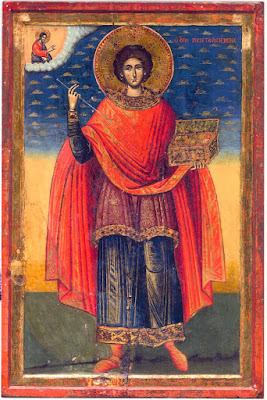 With Him we honor you, O Panteleimon, and magnify you with faith. 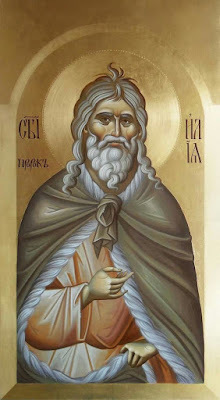 As your zeal for the faith was fervent, O adornment of Champions, you quenched the fire of impiety, and appeared to the world as a light, shining forth with the rays of healings, O Panteleimon, for those who ever take refuge in your protection. In imitation of Christ, you became a spring of compassion, showing mercy on those who hasten to you, O Champion. But I entreat that you might become a helper to me in my infirmity, helping me to lighten the burden of my sins through your prayers. The day of my death is approaching, O my soul, put off laziness and cry out to Christ in contrition: on that coming day, deliver me, O Word, from condemnation, through the sacred supplications of Your Champion Panteleimon. You were made to be a most-awesome dwelling place of the Lord and God, a most-holy home, O All-Spotless One, for Him Who dwelt within you. Entreat Him ceaselessly, that all of us might be delivered from the danger of the enemy, and from the condemnation of the fire of Gehenna. Then, you should rub it into the sick body part. This you should do to every bodily member that is suffering. Regardless of whether you are healed or not, you should do this to be sanctified. I have experienced, however, a multitude of cases of astonishing healing. 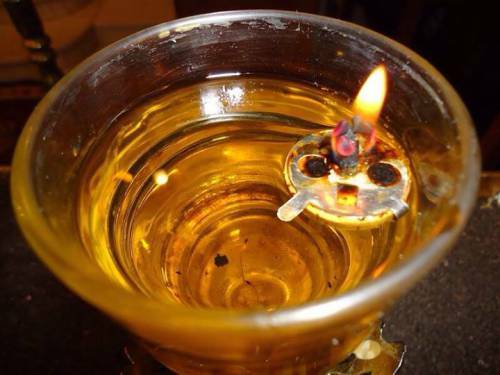 This holy oil [i.e. the Sacrament of Holy Unction] is especially sanctified. It is sanctified on Wednesday or Thursday of Holy Week…"
Kiev, April 20, Interfax - During 25 years from the date of Chernobyl accident the radiation level in the area of St. Elijah Church, the only church operating in the exclusion zone, was well below the level across the zone, Chernobyl disaster liquidators state. 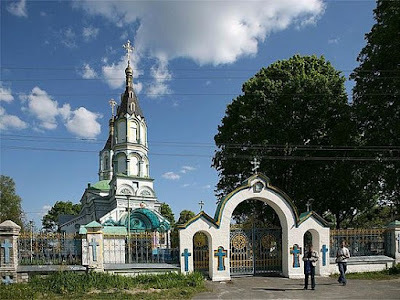 "Even in the hardest days of nineteen eighty six the area around St. Elijah Church was clean (from radiation - IF), not to mention that the church itself was also clean," president of the Ukrainian Chernobyl Union Yury Andreyev said in a Kiev-Moscow video conference on Wednesday. after observing suchdevelopments which could be explained only by God's will," he says. continued moving to the left and right sides of the city instead of covering its residential areas. 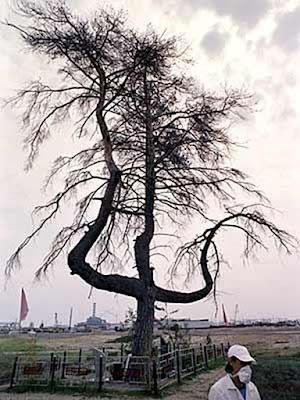 The radiation level in contamination areas was four or five roentgen per hour, and the city showed only half a milliroentgen," Andreyev said. "Elias the Prophet, whose thoughts were in heaven..."
Elias the Prophet, whose thoughts were in heaven, when he saw all Israel prostituting itself from God and clinging to idols, on fire with zeal he drew in the clouds, dried up the earth and shut the heavens with a word, saying: There will be no drop upon the earth, except at my bidding. He is now our host, for ungrudgingly he grants inexpressible grace to us who honour him with faith. Through the prayers of our Holy Fathers, Lord Jesus Christ our God have mercy on us and save us! Amen! 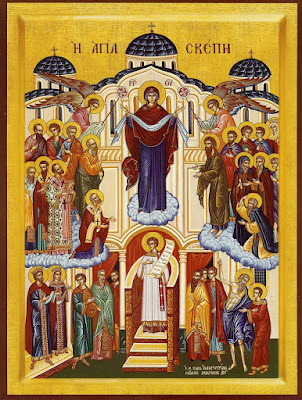 Here is a video clip of the Divine Liturgy from the recent vigil (7/11/15) in celebration of the first feast day since the canonization of St. Paisios. The video is of the service from the Monastery of Souroti outside of Thessaloniki, which treasures the holy and wonderworking grave of St. Paisios. At the feast was present the Ecumenical Patriarch Bartholomew, along with many other bishops, clergy, monks and nuns, and thousands of the faithful. In the video one can see beautiful shots of the church, excellent chanting from the nuns at Souroti, and video of the long line of people waiting to venerate the tomb of St. Paisios. May he continue to intercede for all those who suffer and who need his help throughout the world! Note: This is the summary of an astonishing recent vision regarding the help of the Theotokos. 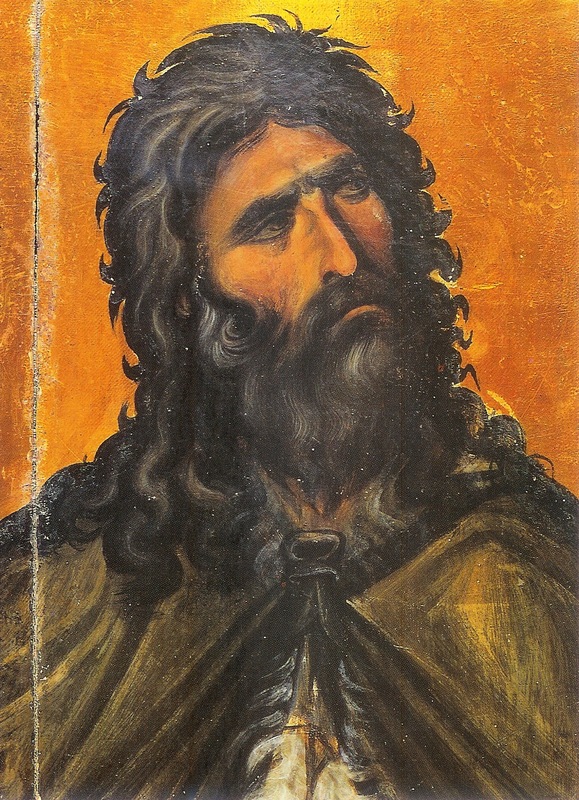 In some ways it resembles prior visions, such as those of Panagia Paramythia from Vatopedi, and the Holy Protection to St. Andrew the Fool-for-Christ. Please note that I have not independently confirmed this, I have only provided my amateur translation as presented on the source site. 1. Christ has utter love and mercy, and He shed His Blood for the whole world. When scriptures discuss punishment or "wrath" of God, this is an idiom of our perception. Christ allows trials and tribulations as a last ditch effort to bring us to contrition and repentance, only when nothing else will work. 2. This does not mean to imply that the Theotokos would ever disobey or dishonor Christ. It just underlines how much she loves and cares for us, as she did at the Wedding at Cana. 3. As long as we repent and return to the Church during our lives, there is no sin that overcomes the love and mercy of Christ. 4. Though this might seem primarily for the people of Greece, the admonition is just as applicable for the whole world. We all have great sins to repent of, and if we do not repent speedily, it may soon become too late to do so. That we might return now to the honors and beginnings passed down from the Fathers! 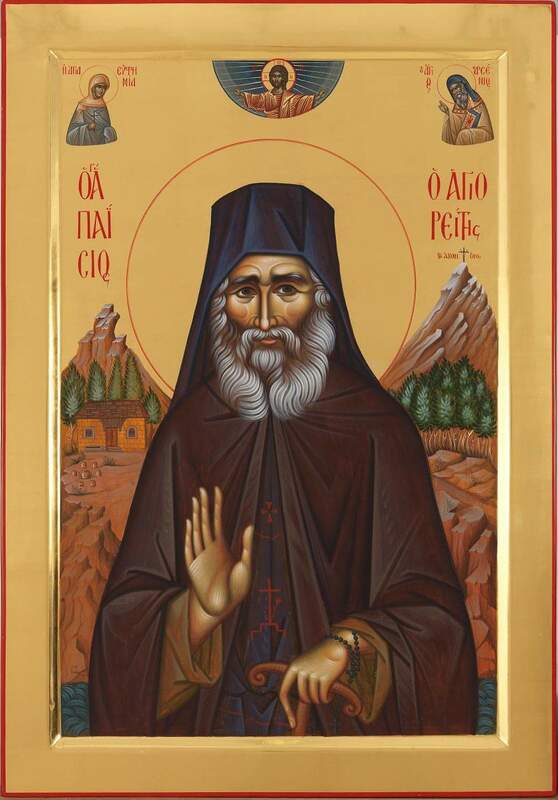 Recently, two services to St. Paisios of Mount Athos have been approved, one written by Metropolitan Joel of Edessa, and one written by the nuns of the Monastery of Souroti. The hymns below are my amateur translation of selected hymns from the service to the Saint by Metropolitan Joel. I include these for two reasons. First, I offer these for those who wish to celebrate St. Paisios the New, whose first feast is next Sunday July 12th (also note that there is an akathist to St. Paisios the Athonite as well). This is truly a great event, which can be seen by the fact that the Ecumenical Patriarch Bartholomew is going to be present himself at the Monastery of Souroti for the feast. However, I also pray that this great Saint of the 20th century might bless, protect and guide the people of Greece as a whole. For those unaware, Greece is currently going through one of its most difficult periods in decades. There have been incredible financial, social, and political upheavals in the last several days, and many Greeks have great insecurity regarding which way to go forward, and what will happen in their future. 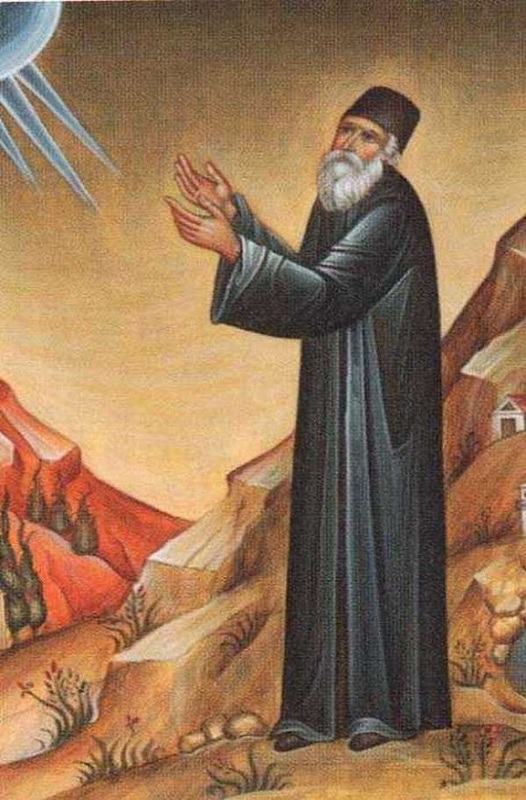 Please pray for the people of Greece, and may St. Paisios guide all Greeks towards true love and philotimo for Christ and for their homeland, and may he help all those who suffer throughout the entire world! 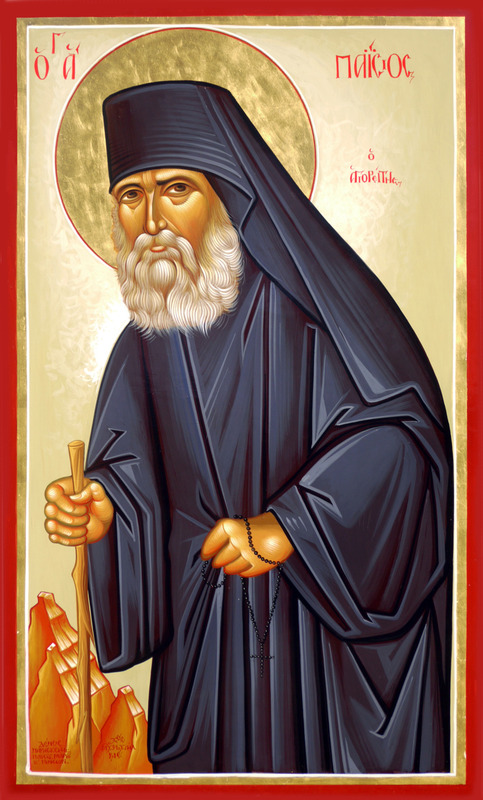 You traveled the path of the ascetics well, towards the working of virtues, O God-bearer Paisios, and you drove out the man of the flesh from your heart, while your nous meditated on unceasing prayer, and theoria of the Uncreated Light. Therefore, having partaken of the gifts of your graces, we hymn you, O Venerable One, and we say with joy: Rejoice, the offspring of Farasa, the pride of Athos, the pillar of Konitsa, the teacher of Monastics, the dweller of Sinai. Rejoice, you who were adorned with the garment of dispassion, and therefore became a guide to the youth, the lifting-up of the fallen, and the return of the deluded. Rejoice, O example for Monastics, the type for laymen, and the rest and refreshment for the faithful Orthodox. And now, O Godly-adorned Elder, ceaselessly entreat Christ God on behalf of us, who celebrate your sacred memory. O venerable Father, every day, a multitude of men surrounded your hut, like as to an ark of salvation, seeking salvation of soul, while others the healing of sicknesses, and others the setting aright of their thoughts, or the solution for their problems in life. Therefore, now to your grave, the faithful similarly hasten, seeking these, O Elder Paisios. Therefore pray for these, that they and we might be granted what is sought for, O ever-blessed one. You lived ascetically, and overcame the pleasures of life, the desires of the flesh, and every passion, O Elder Paisios, and you received a multitude of visitations of divine grace. For in your cell by day, you beheld the Great Martyr Euphemia, and spoke with her as a friend to a friend regarding her martyrdom. In chaste manner, do not cease praying with her on behalf of our souls. The most-famed ascetic of the Holy Mountain, and the newly-enlightened light of the Church, let us praise him with hymns with all our heart, for he leads the faithful towards a perfect life, filling them with rivers of gifts, therefore we cry out: Rejoice, O Father Paisios. Rejoice, the great joy of Athos. Rejoice, the adornment of the Convent of Souroti. Rejoice, incomparable saving ray of healings. Rejoice, for you dwelt on Mount Sinai. Rejoice, you who possessed many graces. Rejoice, the guide of laymen and monastics. Doxastikon of the Praises in the Plagal of the Fourth Tone. O Venerable Father Paisios, throughout the whole land of Greece, and the whole World, has gone forth the word of your deeds, for as a bodily angel from Athos, your life-bestowing teachings of the Gospel have been preached throughout the whole world, and thus, through your life and your deeds, you have become the type for monastics, the teacher of laymen, the guide for the youth, the counsel of the chaste, and the friend of all. Therefore, we humbly pray to you, O Holy One: do not cease to entreat the Lord on behalf of our souls. "Always having Christ active in you, O Unmercenary Saints..."
Always having Christ active in you, Unmercenary Saints, you work wonders in the world, curing the sick; for your surgery is an inexhaustible source; when drawn on, it overflows yet more; when poured out, it still runs over; emptied each day, each day filled up; giving to all, yet not failing; and those who draw receive their fill of remedies, and it remains unexhausted. What then shall we call you? Healing physicians of souls and bodies, healers of incurable sufferings, freely curing all, who have received gifts of grace from the Saviour Christ, who grants us his great mercy.